Semiconductor Engineering - Transdermal patches - a maturing bio imprint application ? Semiconductor Engineering - Transdermal patches - a maturing bio imprint application ? Home > Home > Transdermal patches – a maturing bio imprint application ? Transdermal patches – a maturing bio imprint application ? Kimberly Clark (UK) may be targeting the $3B transdermal patch market, using imprint technology. It looks to me that Kimberly Clark (UK) are targeting the $3B transdermal patch market using imprint technology in a new development program with imprint supplier – Obducat (Sweden). Kimberly-Clark is one of the world’s largest paper companies, who have been acquiring medical companies over the last decade. I have discussed bio applications of imprint in blogs and in papers several times in the past. There has certainly been plenty of research publications; in the field of microfluidics, sensors, tissue growth scaffolds etc. So which application has finally clicked ? This is where the practice of “laying open” patent applications can be very useful. For many years, we only saw patents after they issued, typically 3-4 years after submission. Now they are laid open 18 months after filing. I searched of US patent applications and found one assigned to Kimberley –Clark, in which the specification described the use of the Obducat imprint system. The odds are this is the application that is being targeted. The patent describes new designs for transdermal patches. Conventionally there are only 3 ways of getting drugs into a body; swallow a pill, inhale, or injection. There a few drugs that can be adsorbed through the skin, however the skin is a well-designed barrier system. The idea of a transdermal injection with micro-needles has been around for a while, and is a very attractive idea. It would not hurt, could be left on for a long time allow continuous delivery of a drug giving much better control inside the body. It’s a simple idea that is challenging because the bodies rejection system is triggered by the needles and causes local inflammation. The Kimberly Clark patent describes the use of nano-patterned surfaces to enhance the transmission of drugs through the skin, and the use of micro needles with nano-patterned surfaces to reduce the body’s inflammatory response. They describe the use of geometric surface patterns, and the use of bio-mimicking surfaces in which a specific protein surface is created and then copied using imprint. In one of the examples in the patent, a patterned plastic film is pulled over a set of micro-needles to create a needle with a nano-patterned surface. 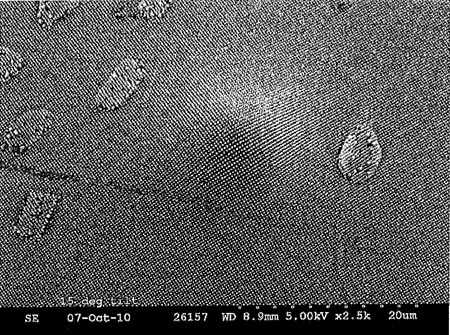 The Obducat system is particularly well suited to the creation of a nano-patterned film. In my view, we can now add transdermal patch to the list of commercially funded development (as opposed to research ) applications for imprint that includes; semiconductor lithography, LED, patterned media for hard disks and now transdermal patches. The critical question for imprint watchers, and investors, is when will one of these jump and join cell phone optics and roll to roll optical films as production imprint manufacturing applications ?